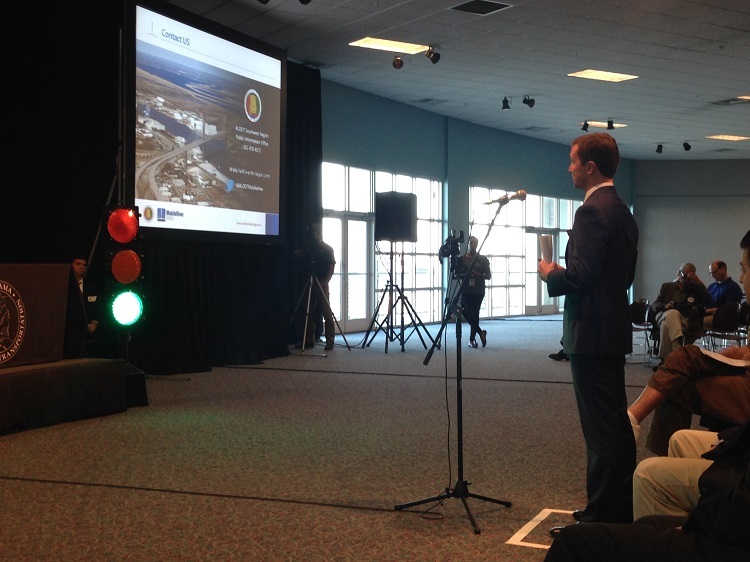 The first of two Alabama Department of Transportation (ALDOT) public hearings about the I-10 Bridge Environmental Impact Statement was held yesterday, September 23rd, at the Mobile Cruise Terminal. The hearing was from 4:00 p.m. to 8:00 p.m. and more than 150 attended. 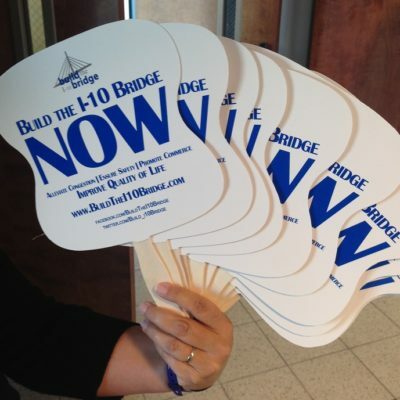 Before entering the meeting room, attendees were offered materials of support from the Build the I-10 Bridge Coalition, including buttons, fans, and bumper stickers stating “Build the I-10 Bridge NOW”. Prior to the public forum, attendees had the opportunity to browse visual displays pertaining to the I-10 bridge project and travel across the proposed bridge in a virtual experience. Representatives of ALDOT and Volkert Engineering were on site to answer any questions. The public forum began at 5:30 p.m. and roughly 30 people provided verbal comments. Speakers included Congressman Bradley Byrne, Mobile County Commissioner Jerry Carl, and the City of Satsuma’s Mayor Pro Tempore Tom Williams. The forum began with a statement by Diane Irby, Executive Director of Planning and Development of the City of Mobile, on behalf of Mayor Sandy Stimpson. Ms. Irby confirmed that the City of Mobile is a “very enthusiastic supporter” of the bridge project and believes that is it essential to quality of life for not just the city but for the entire region. Ms. Irby was one of many who spoke in favor of the bridge’s construction and specifically the B Prime alternative route. Congressman Byrne emphasized that he hears overwhelming support for the bridge from his constituents and from congressmen along the I-10 corridor. 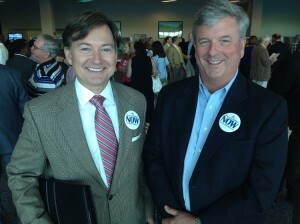 He asked ALDOT to listen to the public and local elected officials and strongly consider B Prime as the optimal route. In addition to strong support of the bridge, many spoke in favor of including a multi-use path on the bridge for pedestrians and bicyclists. Jeff DeQuattro, executive director of the Delta Bike Project, stated that a pedestrian path would increase the quality of life of citizens and tourists and contribute to the health of our community. One speaker in favor of the path asked ALDOT to ensure people can move across the river, no matter how they choose to travel. There were also a few opponents of the bridge, voicing concerns about the bridge’s impact on the Mobile’s historical structures and neighborhoods. Thank you to everyone who attended the public hearing and provided comments. The second public hearing will be held next Monday, Sept. 29th, from 4:00 p.m. to 8:00 p.m. at the Five Rivers Delta Resource Center. The Center is located at 30945 Five Rivers Blvd. Spanish Fort, AL 36527. The 45 day comment period runs through Nov 7th. To view the DEIS and provide comments, please go to mobileriverbridge.com. We look forward to seeing you next Monday and encourage you to come out and make your voice heard! ← Washington D.C. Trip a Success!